Your friends and family may say they don’t want anything from you for Valentine’s day. They may claim that your love and friendship and razor-sharp wit are enough. They may allege that they just want to spend “quality time” with you. They are liars. 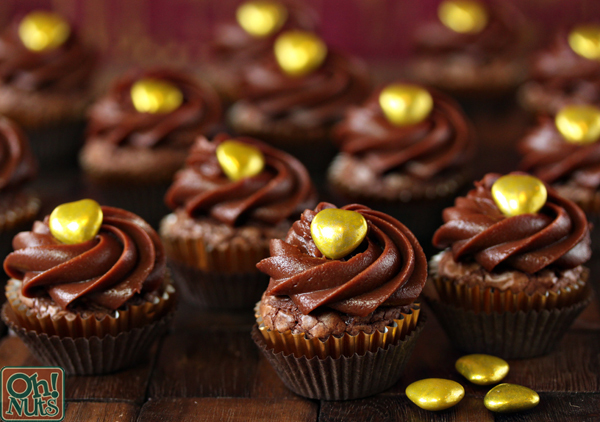 Chances are, what they REALLY want is chocolate, and lots of it. 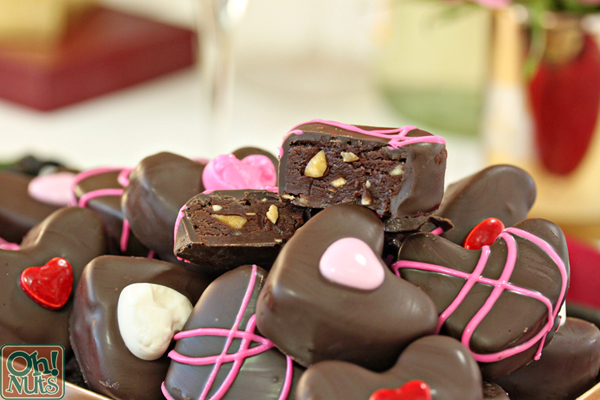 You could take the lazy way out and buy them a box of chocolate at the store, or you could take the delicious way out and whip up a batch of these Nutella Candy Hearts. If you’re a Nutella lover, you’ll flip over these creamy chocolate-hazelnut bites that are studded with lots of crunchy hazelnuts. They require just a few ingredients and don’t take long to make, and one batch makes a large number, so they’re perfect for giving as gifts this Valentine’s Day. 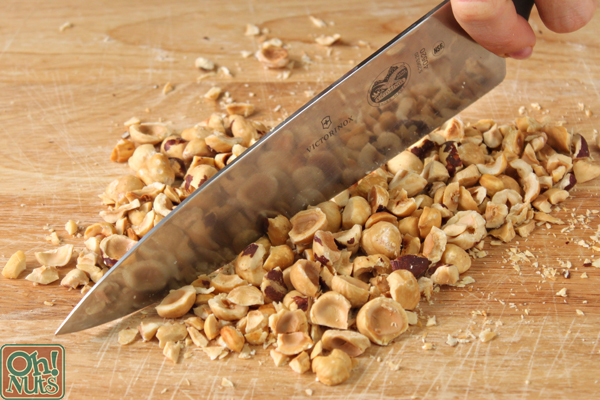 Start by finely chopping the hazelnuts until they are in very small pieces. 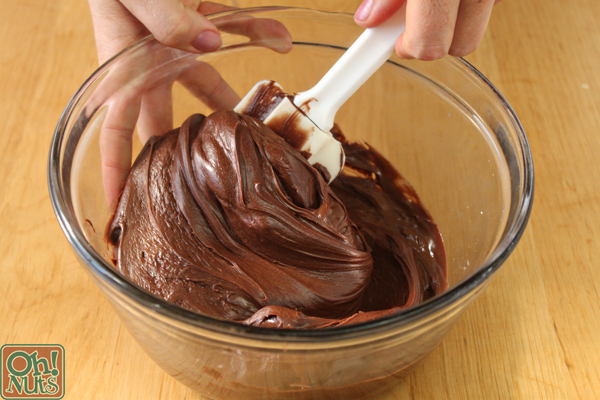 Next, scoop the Nutella and chocolate frosting together into a big bowl. 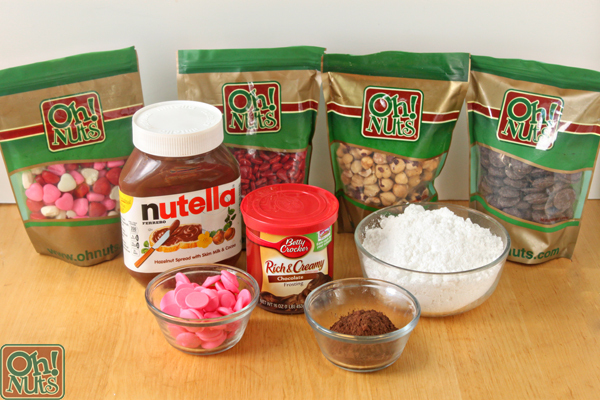 I should mention here that you can use a stand mixer to make this candy, or you can just stir everything together in a big bowl with a spoon or spatula. Speaking of stirring together, get to work stirring the chocolate frosting and Nutella together, until it’s well-mixed and creamy. 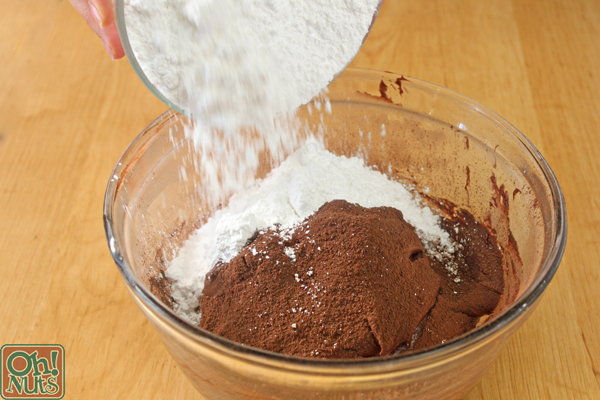 Add the powdered sugar and cocoa powder to the bowl, and start to mix it in. About half way through this process, you’ll start to question and/or curse me, because the candy will start to get stiff and hard to stir. (This is the part where a stand mixer makes things really convenient!) If you’d like, you can forgo the spoon during this part and just get in there with your hands and knead everything together. The candy is finished when all of the sugar/cocoa is mixed in and it has a smooth, pliable texture, like a delicious Play-Doh. If it seems dry or crumbly, add a bit more Nutella, and if it seems too soft and sticky, add a little more powdered sugar. 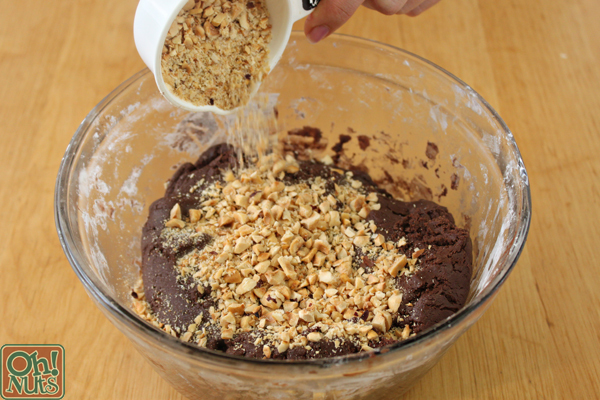 Finally, add the chopped hazelnuts and stir or knead them into the candy. 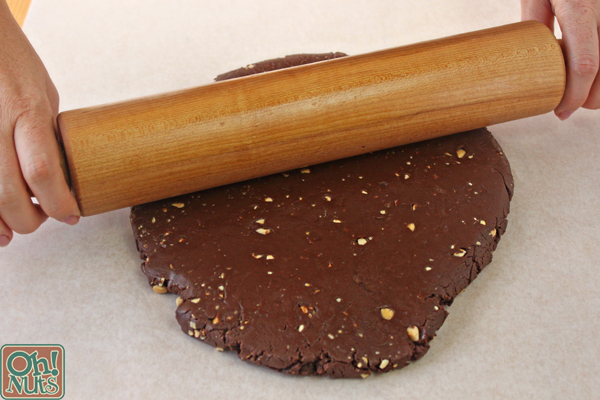 Roll the candy out on a sheet of waxed paper or parchment paper, until it is about 1/2-inch thick. Press a piece of cling wrap on top and refrigerate it until it’s firm, about 1 hour. Once the candy has firmed up, use a small 1-inch heart-shaped cookie cutter to cut hearts out of the candy. The cutter I used is part of a 3-heart set of fondant cutters from Wilton, but any small heart shape will do. (Alternately, you can form them into hearts by hand, but this takes much more time!) Once you’ve cut out as many hearts as you can, re-roll the scraps and continue cutting. This recipe yields about 70 small candy hearts. 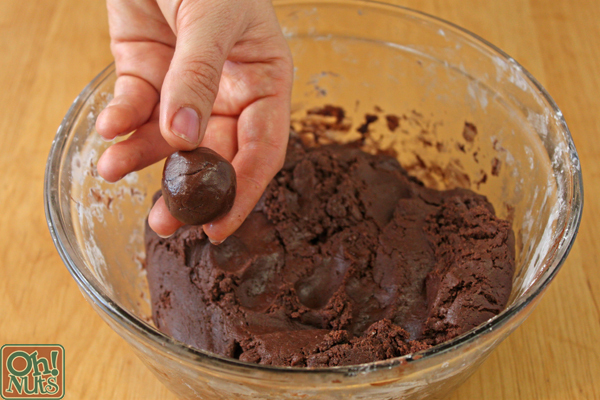 Once the hearts are cut, melt the chocolate candy coating in the microwave in 30-second increments. Stir after every 30 seconds to prevent the coating from overheating. Line several baking sheets with waxed paper or parchment. 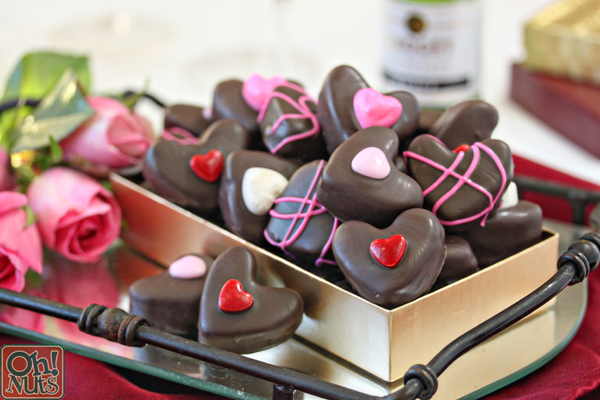 Use dipping tools or a fork to dip a candy heart into the coating, submerging it completely. 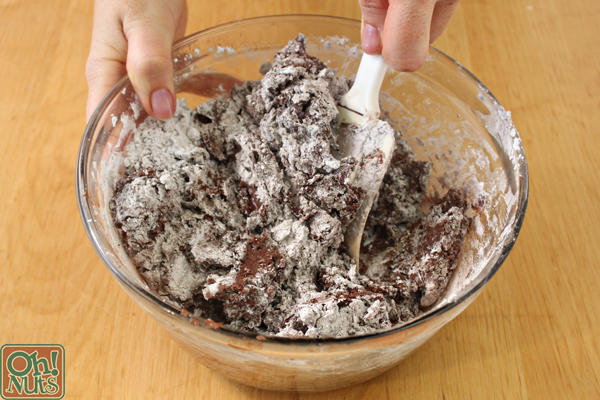 Remove it from the coating and let the excess drip back into the bowl. Scrape the bottom of the candy against the lip of the bowl to remove excess coating, then place it on a prepared baking sheet. While the coating is still wet, press one of your decorative candy hearts into the center. Continue until all of the hearts have been dipped and decorated. 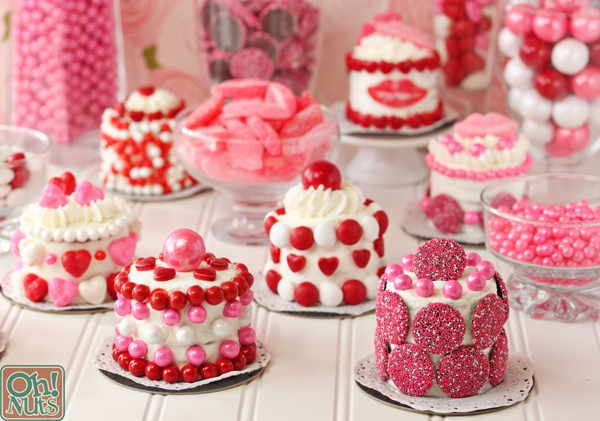 If you want to add a pink drizzle to some of the hearts, leave them blank instead of adding a candy heart on top. Melt the pink candy coating in a small bowl in the microwave, and transfer it to a paper cone, piping bag fitted with a small round tip, or plastic bag with a small hole snipped in the corner. Drizzle the pink color over the hearts. Refrigerate the tray to set the coating completely, for about 15 minutes. 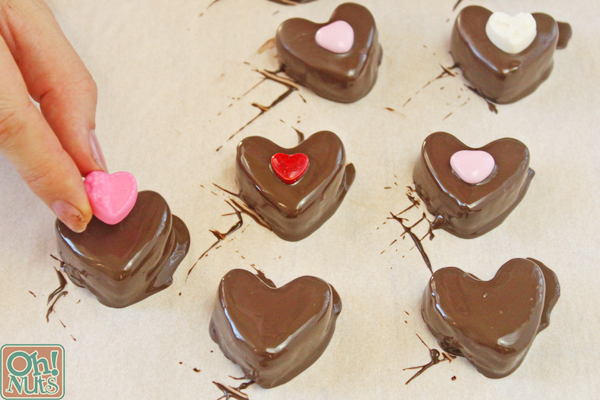 Your Nutella Candy Hearts are now finished! You can store them in an airtight container at room temperature for up to two weeks, but my guess is that they’ll be gone long before then! As always, there’s an easily printable recipe and pin-able image down below. 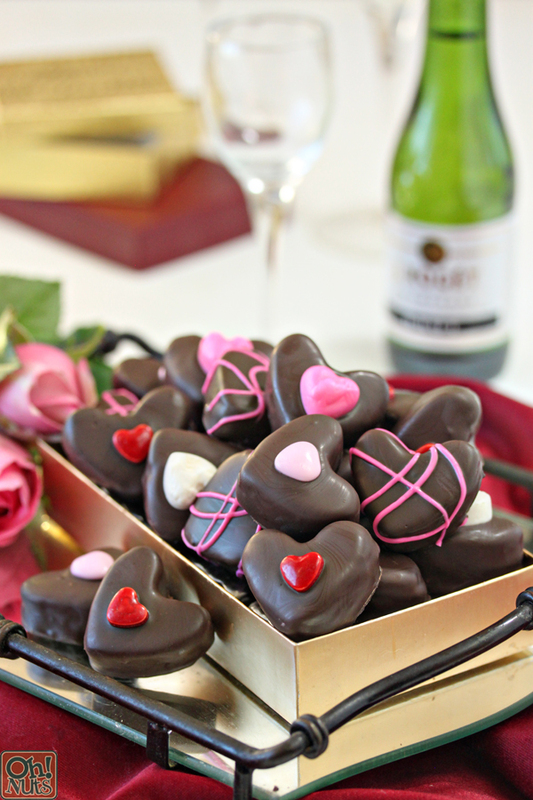 Enjoy, and we’ll be back soon with another Valentine’s Day recipe! Finely chopped the toasted, skinned hazelnuts until they are in small pieces. 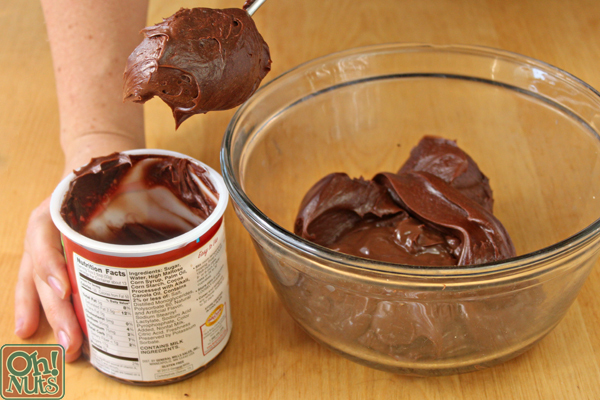 In a large bowl, stir together the chocolate frosting and Nutella. Add the cocoa powder and powdered sugar, and stir until everything is well-mixed. It will be very stiff, and you might find it easier to knead the mixture together with your hands once it gets difficult to stir. (Alternately, you can mix everything together in a stand mixer.) Add the chopped hazelnuts to the Nutella candy, and knead them in. Roll the candy out on a sheet of waxed paper or parchment paper, until it is about ½-inch thick. Press a piece of cling wrap on top and refrigerate it until firm, about 1 hour. Once firm, use a small 1-inch heart-shaped cookie cutter to cut hearts out of the candy. (Alternately, you can form them into hearts by hand, but this takes much more time!) Once you've cut out as many hearts as you can, re-roll the scraps and continue cutting. 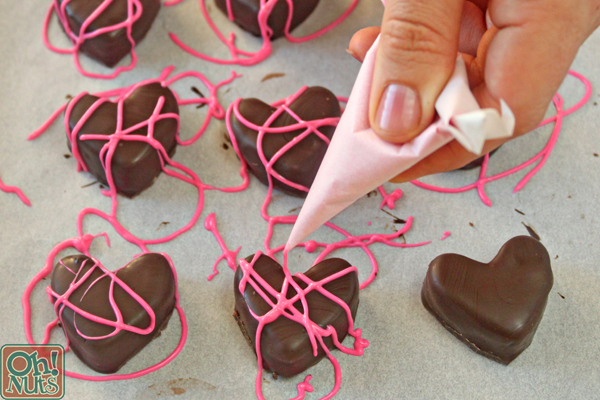 This recipe yields about 70 small candy hearts. 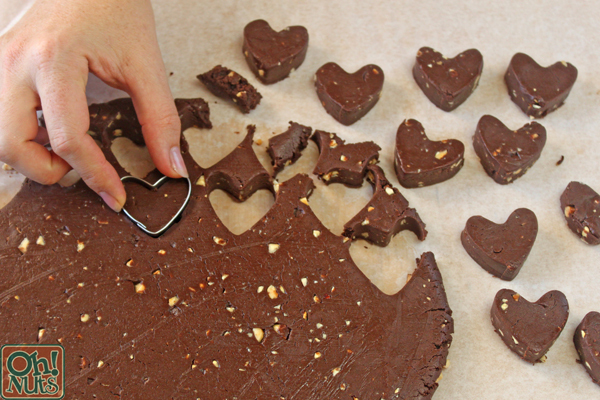 Once the hearts are cut, melt the chocolate candy coating in the microwave. Line several baking sheets with waxed paper or parchment. 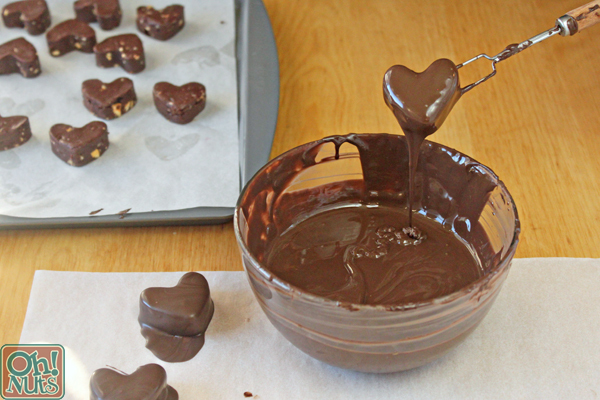 Use dipping tools or a fork to dip a candy heart into the coating, submerging it completely. Remove it from the coating and let the excess drip back into the bowl. Scrape the bottom of the candy against the lip of the bowl to remove excess coating, then place it on a prepared baking sheet. While the coating is still wet, press a candy heart into the center, if desired. Continue until all of the hearts have been dipped and decorated. Store Nutella Hearts in an airtight container at room temperature for up to two weeks.